As the allegations surrounding National Security Advisor Michael Flynn escalate, I wanted to put together for my own use a timeline of key events in this story. The story, as I see it, is the pervasive evidence of Russian interference in the 2016 election and widespread, though murky, evidence of ties between the Russian government the Trump campaign. I’ve always been partial to timelines because … well, we live in time. Chronology is the basic organizing principle of our existence. It allows us to get our heads around scatterings of facts in much the way a good chart allows us to synthesize numerical data. Of course, a timeline can create the impression of causation where none exists. It’s important to keep that in mind. Still, it’s helpful to get a lot of information in one place organized in time. It helps us bound what events can possibly be causally related as well as how they may or may not be related. One point I was trying to illuminate for myself was when Michael Flynn became associated with Donald Trump. I took a renewed interest in this in light of reports that Flynn’s communications with the Russian Ambassador to the United States began during the campaign, not during the transition period. So when did the campaign start for Flynn? As nearly as I can tell from contemporaneous press reports, Flynn’s first meeting with Trump was in the late summer of 2015. Something like an official advisory role began in the Spring of 2016. This is a timeline in progress. I’m still adding details. For the moment, I haven’t added claims of applications for FISA warrants, first denied and later approved. It seems likely to me that these occurred. But the reporting remains murky. I’ve tried to keep the timeline to publicly known incidents and events or those attested and confirmed with specific details by multiple, credible news sources. June 16th, 2015: Donald Trump announces his candidacy for President of the United States. Circa Summer 2015: The US government alleges that Russian hackers first gain access to DNC computer networks. August 8th, 2015: Roger Stone leaves formal role in Trump campaign. Whether he quits or was fired is disputed. Stone will continue as a key, albeit informal advisor, for the remainder of the campaign. December 10th, 2015: Michael Flynn attends conference and banquet in Moscow to celebrate the 10th anniversary of RT (formerly Russia today). Flynn is seated next to Russian President Vladimir Putin at the concluding banquet. March 19th, 2016: Hackers successfully hack into Clinton campaign Chairman John Podesta’s email. March 21st, 2016: In a meeting with The Washington Post editorial board, Trump provides a list of five foreign policy advisors. The list includes Carter Page but not Michael Flynn. The list is Walid Phares, Carter Page, George Papadopoulos, Joe Schmitz, and ret. Lt. Gen. Keith Kellogg. March 28th, 2016: Trump campaign hires Paul Manafort to oversee delegate operations for campaign. Manafort becomes the dominant figure running the campaign by late April and takes over as campaign manager on June 21st with the firing of campaign manager Corey Lewandowski. February-April 2016: Flynn advisory relationship with Trump appears to have solidified over the Spring of 2016. In late January Flynn is mentioned as an advisor who has “regular interactions” with Trump. There are similar mentions in February and March. Yet as late as mid-March, Flynn appeared to downplay his ties to Trump. By May Flynn is routinely listed as an advisor and by late May is even being mooted as a possible vice presidential pick. April 2016: DNC network administrators first notice suspicious activity on Committee computer networks in late April, 2016, according to The Washington Post. The DNC retains the services of network security firm Crowdstrike which expels hackers from the DNC computer network. Crowdstrike tells The Washington Post it believes hackers had been operating inside the DNC networks since the Summer of 2015. June 14, 2016: Washington Post publishes first account of hacking of the DNC computer networks, allegedly by hackers working on behalf of the Russian government. July 11th-12th, 2016: Trump campaign officials intervene to remove language calling for providing Ukraine with lethal aid against Russian intervention is Crimea and eastern Ukraine. It is, reportedly, the only significant Trump campaign intervention in the platform in which the Trump campaign has allowed activists a free hand. July 12th, 2016: Official publication date, The Field of Fight by Michael Flynn and Michael Ledeen. July 22, 2016: Wikileaks releases first tranche of DNC emails dating from January 2015 to May 2016. August 1st, 2016: Trump campaign chair Paul Manafort denies Trump campaign changed GOP platform on Russia and Ukraine. 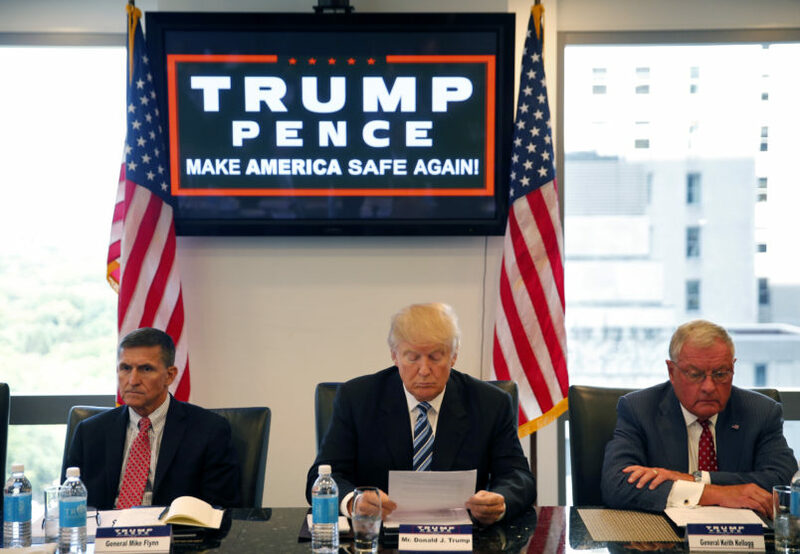 August 17th, 2016: Nominee Donald Trump receives his first intelligence briefing with Gen. Michael Flynn and Gov. Chris Christie in attendance. August 19, 2016: Paul Manafort resigns from Trump campaign. September 26th, 2016: Trump Russia-Europe Policy Advisor Carter Page steps down from campaign while disputing allegations that he engaged in private communications with Russian government officials. A Yahoo News article from three days earlier reported that US intelligence officials were probing whether he met privately with Russian officials in Moscow in July, including an alleged meeting with close Putin ally Igor Sechin, Chairman of Russian oil company Rosneft. October 7, 2016: Wikileaks releases first batch of Podesta emails – one hour after release of Access Hollywood Trump tape. October 12th, 2016: Stone says he has been in contact with Assange through an intermediary. December 9th, 2016: Sen. John McCain (R-AZ) hand delivers a selection of memos (aka ‘the Steele dossier’) to FBI Director James Comey. December 29th, 2016: President Barack Obama outlines a wave a sanctions and expulsions of Russian diplomat in response to Russian efforts to interfere in the 2016 election. December 29th, 2016: Russian presidential spokesman Dmitry Peskov vows retaliation for sanctions. December 29th, 2016: Incoming National Security Michael Flynn has multiple phone conversations with Russian Sergey Kislyak. It is later reported that the calls covered US sanctions and suggestions that Obama’s punitive actions could be undone in a matter of weeks. Trump administration officials had repeatedly denied that the conversations involved more than pleasantries and logistics about future meetings. December 29th-30th, 2016: Russian Foreign Minister Sergei Lavrov announces preliminary plans to expel American diplomats. December 30th, 2016: Russian President Vladimir Putin says he will not retaliate against sanctions and expulsions but await presidency of Donald Trump. January 19th, 2017: The New York Times reports that the FBI is leading an interagency task force probing ties between Russia and three close Trump associates: Paul Manafort, Carter Page and Roger Stone. January 26th, 2017: Acting Attorney General Sally Yates and a senior intelligence official visit to White House Counsel Donald McGahn to deliver the message that National Security Advisor Flynn has deceived the Vice President about the subject matter of his calls and may be subject to Russian blackmail. February 13th, 2017: Michael Flynn resigns as National Security Advisor.